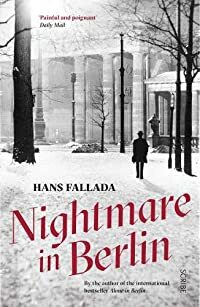 Nightmare in Berlin by Hans Fallada was published in German in 1947 and it was translated by Allan Blunden. This is the second book by Hans Fallada that I’ve read, the first one was Alone in Berlin and although that one is more tense and ultimately very sad, I preferred it to this one which dragged a bit in the middle for me. The book begins in April 1945 Berlin, for the Germans the war is over. Doctor Doll is the mayor of a small town in north-east Germany and it’s now occupied by the Russians. Doll had been quite a successful writer before the war and he had lived in Berlin but he and his wife had had enough of the bombing raids earlier in the war and had moved to the small town. In the end things didn’t go well for them there so they returned to Berlin. It transpires that Doctor Doll and his wife are both addicts, she’s a morphine addict and he’s a sleeping tablet addict and in Berlin their entire life revolves around getting their next fix. Addiction is common, especially amongst the medical profession, apparently nerves had been shattered by the bombs and people had resorted to chemical crutches. At the beginning of this book the inhabitants are all trying to distance themselves from the Nazis and feel guilt over the war that they had started, but towards the end the life they were all having to lead is making some of them long for the good old days of the Nazis when food was more plentiful. An unforgettable portrayal of the physical and psychological devastation wrought in the homeland by Hitler’s war. Hans Fallada was dying when this book was about to be published and from the potted biography at the beginning of the book it’s obvious that this is really based on his own experiences. This entry was posted in Books and tagged Hans Fallada, Nightmare in Berlin by Katrina. Bookmark the permalink. This does sound very interesting but also depressing. The author’s name sounds familiar but I had not heard of these books. It is a bit depressing, although I didn’t realise when I was reading it that it was so autobiographical. I haven’t read this, but I’ve enjoyed some of Hans Fallada’s other books, especially Alone in Berlin and Little Man, What Now? I’ll have to look out for this one. I’ll have to look for Little Man, What Now? I haven’t read any of Hans Fallada’s books.This one does indeed sound like a nightmare and even more poignant as it was based on his own experiences. I’m not sure I could read it. I only recently realised how bad the last months of the war were for Germans with hundreds of thousands of them apparently dying of starvation. I am interested in this one by Hans Fallada, which I haven’t read. I am intensely interested in novels that were written immediately after the war’s end. I have read quite a number. They are all very, very dark. The Fallada novel I have read has a different title in some countries, but it was his most noteworthy novel, and when I read it, it was entitled Every Man Dies Alone. I know the title in the UK is different, or so I have been told. Thanks so much for reporting on this one. I need to read it, and I wouldn’t have known about it without you remarking on it. I think that one is called alone in Berlin in the UK. I believe they made a film of it last year. The ending is quite horrific though.